What Is Posterior Tibial Tendon Dysfunction (PTTD) and What Causes It? Posterior Tibial Tendon Dysfunction (PTTD) is an inflammation and/or overstretching of the posterior tibial tendon in the foot. An important function of the of the posterior tibial tendon is to help support the arch. But in PTTD, the tendon’s ability to perform that job is impaired, often resulting in a flattening of the foot (or collapse of the arch). Overuse of the posterior tibial tendon is frequently the cause of PTTD. The symptoms usually occur after activities involving the tendon, such as running, walking, hiking, or climbing the stairs. The posterior tibial tendon starts as a muscle in the calf and becomes a fibrous cord that stretches down behind the inside of the ankle, and attaches to bones in the middle of the foot near the arch. This tendon helps hold the arch up and provides support when stepping off on your toes when walking. If it becomes inflamed, over-stretched or torn, it can cause pain from the inner ankle. Some patients also exhibit pain in the arch area where that tendon attaches. Over time, it can lead to losses in the inner arch on the bottom of your foot and result in adult-acquired flatfoot. PTTD is often called adult-acquired flatfoot because it is the most common type of flatfoot developed during adulthood. Although this condition typically occurs in only one foot, some people may develop it in both feet. PTTD is usually progressive, which means it will keep getting worse—especially if it isn’t treated early. What are some Signs and Symptoms of PTTD? Signs and symptoms of posterior tibial tendon dysfunction change as the condition progresses. Early signs are pain on the inside of the foot and ankle (along the course of the tendon). There may be pain, swelling, redness and warmth along the same area. A flattening if the arch may also even be seen in the early stages. As the condition progresses, the arch begins to flatten more. There may still be pain on the inside of the foot and ankle. At this point, the foot and toes begin to turn outward and the ankle turns inward. As PTTD becomes more advanced, the arch flattens even more and pain often shifts to the outside of the foot, below the ankle. The tendon has deteriorated considerably and arthritis often develops in the foot. In more severe cases, arthritis may also develop in the ankle. Because of the progressive nature of PTTD, it’s best to see your foot and ankle surgeon as soon as possible. If treated early enough, your symptoms may resolve without the need for surgery and progression of your condition can be arrested. Left untreated, posterior tibial tendon dysfunction may lead to an extremely flatfoot and arthritis in the foot and ankle. Pain can increase and spread to the outer side of the ankle. Pain from this condition may increase limitations on walking, running, or other activities. 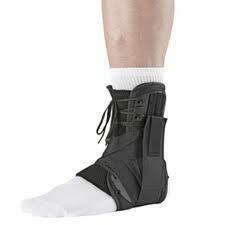 Immobilization: Sometimes a short-leg cast or walking boot is worn to immobilize the foot and ankle to allow the tendon to heal. Some patients may even need to avoid all weight-bearing for a short period of time. Weight Loss: This can be an important factor in decreasing painful symptoms of PTTD. Orthotic Devices: To provide proper support, your foot and ankle surgeon may recommend an ankle brace or Custom Made Orthotics. Physical Therapy: Stretching exercises, icing, formal Physical Therapy by a Physical Therapist, supportive taping and bracing may be necessary as well. Ultrasound is a common modality used to help rehabilitate the posterior tibial tendon. Medications: Nonsteroidal anti-inflammatory drugs (NSAIDs) may be recommended to help reduce pain and inflammation. NOTE: Please consult your physician before taking any medications. Shoe Modifications: The foot and ankle surgeon will advise you on footwear changes to make with your shoes and may provide special inserts designed to improve arch support. In cases of PTTD that have progressed substantially or have failed to improve with non-surgical treatments, surgery may be required. For some advanced cases, surgery may be the only option. Surgical treatment may include repairing the tendon, realigning the bones of the foot, or both. Your foot and ankle surgeon will determine the best approach for your specific case.